DC Gastronome: Each one she passes goes "a-a-ah!" 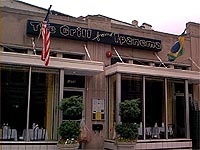 Last Friday we checked out the Grill from Ipanema, the Brazilian restaurant in Adams Morgan. The Washingtonian said reservations were essential, but the torrential downpour and the friendly staff ensured that our party of 3 had a table fairly quickly. The decor at the restaurant, which incorporates palm trees and twinkle lights, conspires with the sights and smells of authentic Brazilian cuisine. A first round of caipirinhas is a must. As most of the menu is on the heavy side, the acidity and brightness of the cocktails (cachaça, made from fresh sugarcane juice that's fermented and distilled, mixed with sugar and crushed limes) will cleanse your palate - they will also make the palm trees sway. We had the advantage of having a Brazilian-in-exile in our party, so all the credit for choosing our fantastic meal goes to her. To depart from the Churrasquerias we already know, she ordered the linguica encebollada (grilled sausages with onions), a fantastic cheese croquette (more solid and less gooey than its Spanish counterpart), and dried beef, still on the bone. The entrees are on the expensive side - averaging at over 20 dollars, but they are meant to be shared. 2 entrees were more than enough to satisfy our party of three. We had a bahia stew with shrimp (served with rice and yuca powder on the side) and feijoada, the national dish of Brazil, a stew made with beans, dried beef, and pork products and comes with rice, chopped refried collard greens (couve mineira), lighly roasted coarse cassava flour (farofa), and a peeled and sliced orange. The combination works and the layering of flavors, intensely salty to the citrusy, and textures, solid beans to slippery pork loins, is like no other I have tasted. We had absolutely no room for dessert, but I did finish my meal with some Brazilian coffee. I look forward to going back again soon.